There is no doubt about it -- for many women, wearing heels makes us feel more confident, sexier and of course, taller. Then, when you get pregnant – a time you desperately want to feel sexier -- you have to consider: Should I be pregnant in heels? Is it even safe? 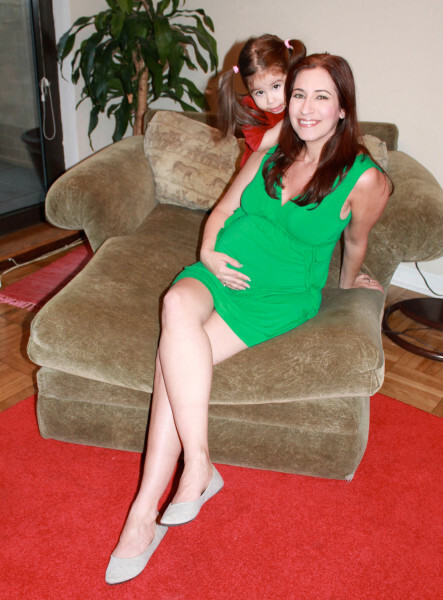 You would think my answer is obvious since I was one of the moms-to-be featured on season one of the Bravo show “Pregnant in Heels.” The show was a great experience, and yes, I wore heels. Late in that pregnancy though, I developed plantar fascitis (inflammation of the thick tissue on the bottom of the foot). Basically I put too much weight on my small frame and my feet couldn’t handle it. The treatment? Comfortable shoes. At 6 months pregnant, Cindi Avila, with daughter Alexia, has given up heels in her second pregnancy. For the last month or so of my pregnancy I was in sneakers and Crocs. For big occasions I still swapped out the comfy shoes for heels, but only at the last minute. Fast-forward to now, and pregnancy Number Two. I decided to ditch the heels entirely (well, almost entirely). I was having enough normal pregnancy symptoms (i.e. nausea, fainting spells, general aches and pains) that I didn’t need to add more problems by walking in heels. 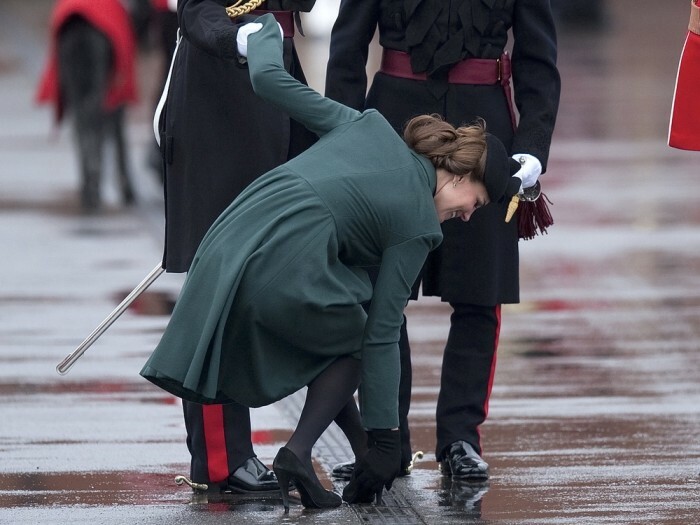 Seeing a pregnant Kate Middleton get her heel stuck in a grate recently was enough to convince me I made the right decision. I have been living in flat boots and sneakers. Medical professionals tell me I’ve made the right decision for several reasons. Dr. Lawrence Silverberg, a podiatrist from City Footcare in New York City, says that wearing high-heeled shoes significantly increases the amount of force on the metatarsals, the long bones behind the toes. (Flat shoes don’t do that.) “The added weight of pregnancy means even more force on those bones,” Silverberg says. “The most common and severe foot problems I see in my podiatry practice in pregnant women are stress fractures,” Silverberg said. While the foot reasons may be obvious, there are a lot of other problems that can come from wearing heels while pregnant. Karena Wu, a physical therapist from Manhattan-based ActiveCare Physical Therapy, says back problems are another issue. Even the queen of Manolo Blahniks, Sarah Jessica Parker, recently explained in an interview why she is cutting back on heels. She told Net-a-Porter.com that after suffering a couple falls, a foot doctor told her that her feet were, basically a wreck. Although I gave up my heels during this pregnancy, I’ve had other shoe issues. Britain's Prince William (L) supports his wife Catherine, Duchess of Cambridge as she pulls her heel from a grate during a visit on St Patrick's Day to Mons Barracks in Aldershot, southern England. Ultimately I learned my lesson: Whether we are pregnant or not, we shouldn't let shoes define us. Jehmu Greene, the former president of the Women's Media Center in Washington D.C., puts it perfectly. "Feminism empowered us to pick and choose our footwear,” says Greene, citing celebrities such as Kim Kardashian, Beyonce and Jessica Simpson, who have all flaunted heels while pregnant. Greene acknowledges it's their choice "to teeter on heels with 30 extra pounds" extended from their bellies. However, Greene thinks pregnant women should stick to common sense and listen to their bodies. "Yes,we are women, hear us roar. But your pregnant feet (and backs) don't need to."